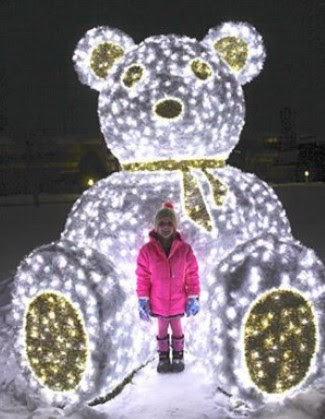 Aurora’s RiverEdge Park will be illuminated this weekend when the City of Aurora powers on its new “Winter on the Fox” interactive light display featuring larger than life-size ornaments, stars, gift boxes, reindeer and more. The Community Lighting Ceremony will be held at 6 p.m. on Friday, December 7 at the main entrance of RiverEdge Park, 360 N. Broadway. Mayor Irvin will be joined by special guests to officially open Winter on the Fox during the Community Lighting Ceremony this Friday. The ceremony will include performances from local high school choirs, a singing Santa Claus and a fire flow artist who will help warm up the night with an energetic fire routine with fire fans and blazing staffs. In collaboration with Aurora’s Downtown’s “Cocoa Crawl” at December First Fridays, limited free hot cocoa and candy canes will be available on a first come-first served basis. Popular local food trucks will be on site with other tasty foods and hot drinks for sale. After the lighting ceremony on Friday, the displays at Winter on the Fox will be turned on each evening from 3:30 p.m. until 9 p.m. through Friday, January 4. Special weekend activities will be featured from 3:30 p.m. to 6:30 p.m. on Saturday, December 8 and Sunday, December 9 with food vendors and holiday music; and on the weekend of Saturday, December 14 and Sunday, December 15, when families can take free photos with Santa Claus, listen to holiday music and shop from a variety of local vendors. Winter on the Fox is free admission and open to the public.